The Church Year and the Art of Clemens Schmidt provides selections from the work of noted liturgical artist Clemens Schmidt in a convenient book/CD-ROM format that illustrate themes organized according to the liturgical year. The variety of line drawings and calligraphy offers a wealth of opportunities for illustrating bulletins, programs, church, school, or personal documents with clip art. The Church Year and the Art of Clemens Schmidt CD-ROM provides a listing of over 105 black-and-white clip art images each saved in three formats: TIFF, BMP, and JPEG. Average image size is 2 ½ x 2 ½ inches at 100%. Each is saved at a resolution of 300 dpi. A set of contact sheets on the CD displays thumbnail black-and-white images. The indexed, searchable contact sheets can be viewed in Adobe Acrobat Reader, which is included on this CD. The clip art images are stored in folders labeled according to the image format (TIFF, BMP, or JPG). They can be inserted into a document using the normal graphic import functions of the word processing or page layout program. 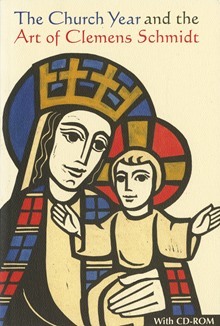 Clemens Schmidt (1901-1984), is a noted liturgical artist whose designs and calligraphy have appeared for over thirty-five years in publications of The Liturgical Press, particularly in the Bible and Liturgy Sunday Bulletins. Placid Stuckenschneider, OSB, is a liturgical artist at The Liturgical Press and curator of art at St. John's Abbey, Collegeville, Minnesota. He has designed book covers and illustrated texts for books and the Bible and Liturgy Sunday Bulletins published by The Liturgical Press. He has compiled clip art for Clip Art for the Liturgical Year, More Clip Art for the Liturgical Year, and Even More Clip Art for the Liturgical Year. His most recent publication is Clip Art, More, and Even More Clip Art for the Liturgical Year: CD-ROM Edition.